Location: June 23-24 & June 26-27, Fields Institute, 222 College St. The theory of operator algebras and operator theory has held a significant place in the Canadian mathematical community for many years. 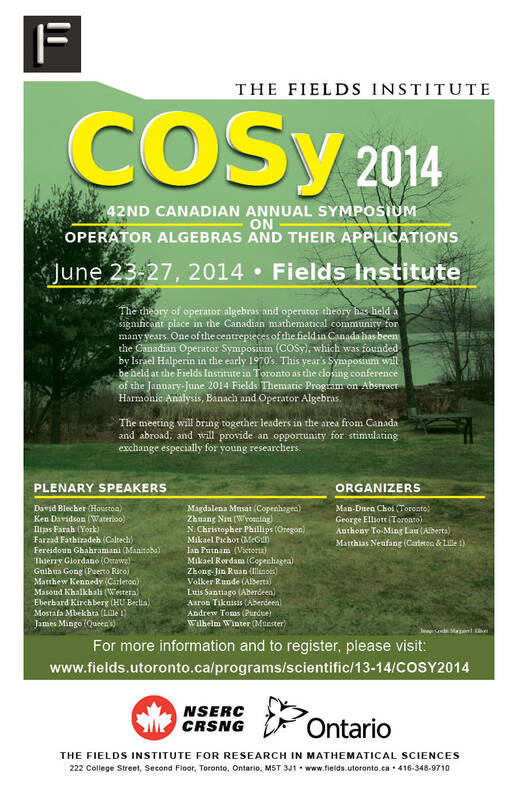 One of the centrepieces of the field in Canada has been the Canadian Operator Symposium (COSy). Founded by Israel Halperin in the early 1970s, the 2014 meeting will be the 42nd time this Conference has been held. to provide a resource for young researchers - graduate students, post-doctoral fellows and young faculty.